One hundred dollar coaching session with author Larry Brooks, just one of many amazing prizes in my Fab 500 Followers, prize give~a~way. Larry Brooks is the author of several critically-acclaimed thrillers and a manuscript coach. In addition, Brooks has authored several fiction craft books, including his bestseller, Story Engineering: Mastering the Six Core Competencies of Successful Writing. 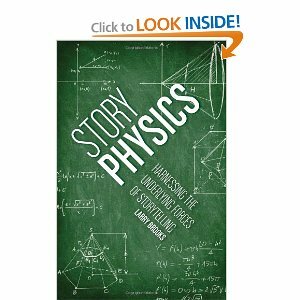 His next writing craft book, Story Physics: Harnessing the Underlying Forces of Storytelling, is scheduled for release next month. This post is not a review of either book. So why am I writing it? Well, if you've entered my blog prize give a way, you've undoubtedly noticed that the prizes include a $100 coaching session with Larry Brooks, "your story of steroids," and a copy of his newest book, Story Physics. Just in case any of you are unfamiliar with Larry Brooks, I want you to check out his writing-skills website. 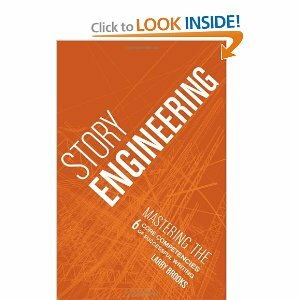 He does an amazing job of explaining the six core competencies on his Story fix website and he also deconstructs popular novels & films, to give his readers a step by step guide to effectively utilizing his six core competencies and story engineering. Before reading Brooks, I had a story, a damn good story, I had it on paper and I had my well developed characters. My protagonist had a clear and defined goal motivated by an inner goal and she was moving along -working toward that goal, all the while being thwarted by the antagonists and antagonistic forces. That's right baby, I had conflict...lots of it. I had tension, raised stakes, suspense, I had it all (or so I thought), but something was clearly wrong with my story. What the hell was it? My story structure was off. I was what we often call a "pantster", or better said, I wrote by the seat of my pants. Why? Because, ever since high school, I've have loathed outlines. In my mind, writing a story according to a "formula", was a formula for creative disaster. Brooks opened my eyes and changed my mind. I now realize that every author (every successful author) follows proper story structure, whether they realize it or not. A writer may not outline, or plot plan before they begin their first draft, but that just means that their draft becomes their planning or plotting tool. I've come to realize (the long & hard way) that every successful author, eventually follows story structure. There is no getting around it. If you write a book where the first plot point does not occur until midway through your book...it will not sell. Eventually all successful writers align their story with the principles of the six core competencies. I said this was not a review and it's not. I'm not going into that much detail. I will tell you that if you read Larry Brooks or if you follow his blog or retain his manuscript coaching services, you will be ahead of the pack because you will understand the six core competencies. Of course, each of the above core competencies breaks down into other sub-categories. You'd be amazed at how many writers have a difficult time relaying to another the "concept" of their story. Notice I said, "concept", I did not say premise or idea. You get the idea. Well, you will get the idea and more than that, if you follow Larry Brooks. The area I benefited most from is the simple way that Brooks breaks down the plot points & pinch points in a four part story. With his help, you will not only know what to write, but you will know when to write it, and exactly where, in your novel, it goes. You will no longer wonder where a certain scene fits into your novel. You will grasp where it goes, what comes before it and what to write next. This helped me immensely. I love his beat sheets. They allowed me to break my story into four parts, aligned with the six core competencies. By knowing where my first and second plot points, mid point, and pinch points needed to be, I was better able to foreshadow suspenseful scenes, plan my set ups and pay offs and it saved me from the countless number of drafts I was accustomed to writing during my revision stage. 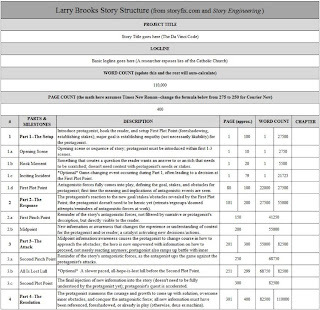 Paranormal Author, Jamie Gold, has an excellent blog post, "How to Revise for Structure Part Two," where she explains Story Structure, according to Larry Brooks in a short, easy to read article. 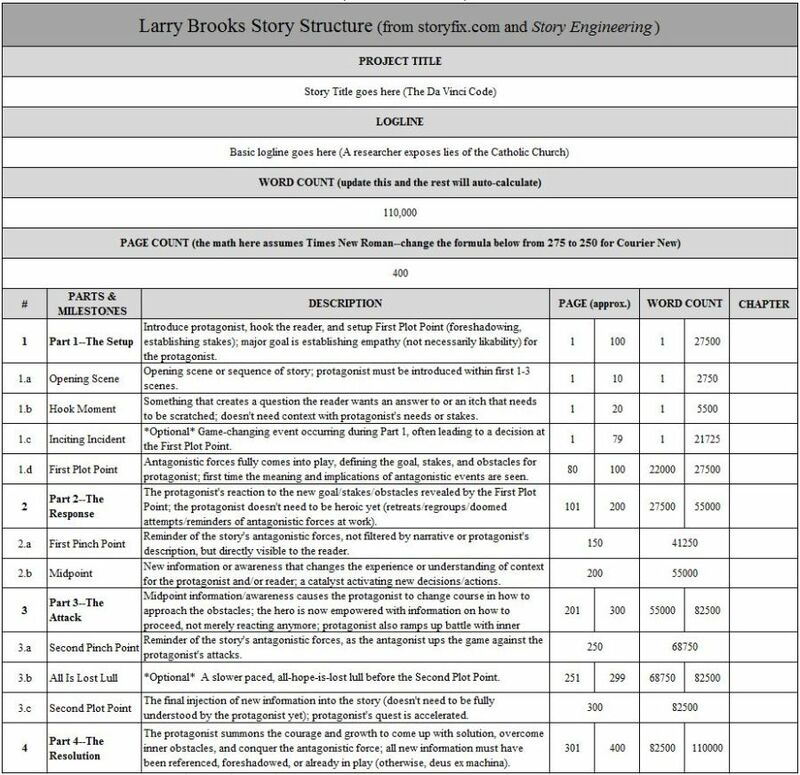 As a bonus she includes a link for you to download her story structure spreadsheet, adapted from Larry Brooks' Story Engineering. Jami admits, that like me, math is not her favorite subject. She borrowed her spreadsheet from Liz Brooks. Listen to Larry Brooks explain his beat sheet. Here is his guest post on Stephanie Shackelford's Routines for Writers. Want more? Who didn't love The Hunger Games? That's what I thought. So head over and read Larry's Hunger Games Beat Sheet. I promise, you will be impressed. If you have some time, watch Joanna Penn's you tube interview with Larry Brooks. So, while I know that an iPad mini is an awesome prize...thank you very much. The other prizes are pretty damn good. Don't forget to comment on this post or any post here or on my second, just launched blog, Karma Carbs for an additional contest entry. You can also earn multiple-daily entries for giving this contest a social media shout-out. Just tweet or shout- out, anywhere a link to this contest, I love my Followers, for extra entries to win a "Your story on steroids," $100 Larry Brooks Coaching Session, or a copy of Larry Brook's newest writing craft book Story Physics. It will be released in June and I can't wait to get my hands on it. Don't forget you can also win a copy of Jessica Bell's Adverbs and Cliches in a nutshell. His beat sheet reminds me of Blake Snyder's in Save the Cat. Will have to download one of his books. It's very similar. Also, if your check out Jami Gold's site, she has a Blake Snyder spreadsheet as well. She also has a turbo-super charged spread sheet, where she combines both Snyder's & Brook's beat sheets into one excel document. It's really good. You just plug in your word count and it tells you where (approximate page number of your manuscript) each important plot point or twist should be. Alex, my reply to your comment is above. I typed it in the wrong box. Oops. Alex is right. It's very similar. Haven't had time to study it but I'll do it in the near future. I write by pantsing it too! I guess there must be some sort of structure....wow. never thought of it! Great post girlie! I've read Story Structure. Will be interested in Story Physics. I can't wait to get my hands on it. Thanks. It finally made sense to me when I read his book. It is very similar, Al. I like the combined version that I mentioned in my post. It works great for me.